The CAB is delighted to present a new project by Los Angeles based artist Richard Jackson, a pre-eminent figure in American contemporary art since the 1970’s. Influenced by both Abstract Expressionism and action painting, Jackson explores a performative painting process which seeks to expand the potential of painting by upending its technical conventions. 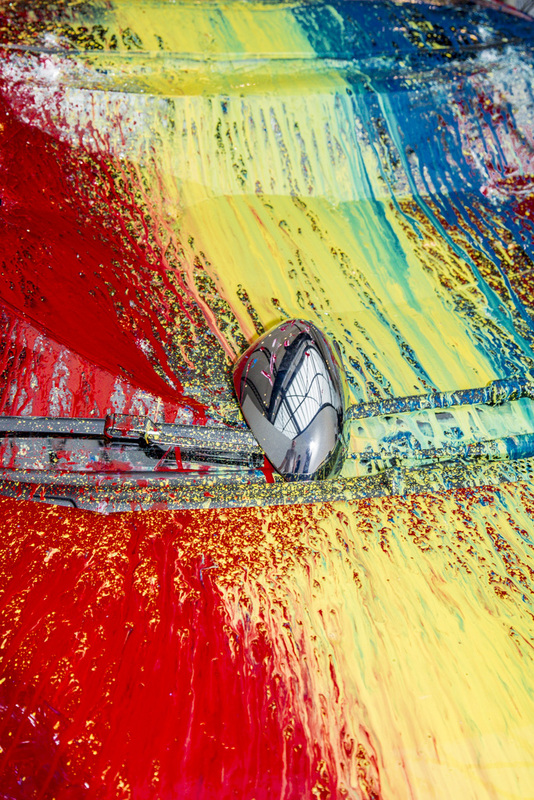 For Jackson, paint is not a tool used to create a representational image, but is a ubiquitous liquid which is spurted, splattered and sprayed over the surface of his installations. 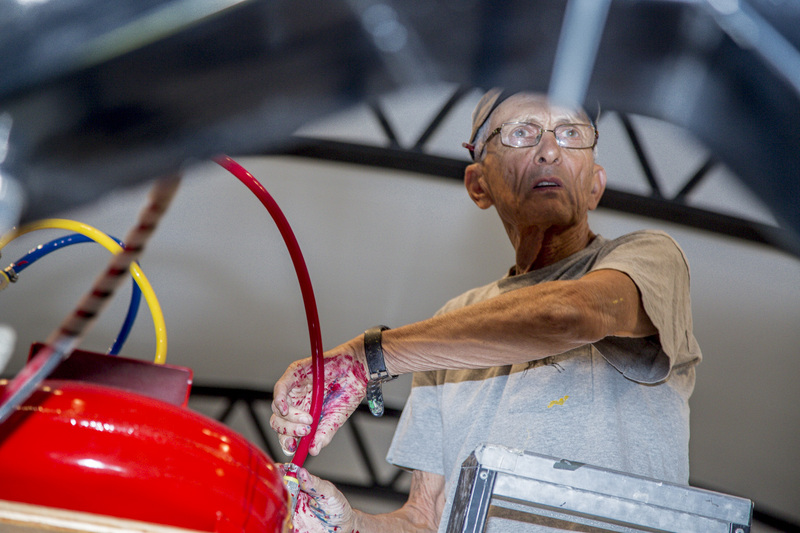 Since the 1990’s his proclivity towards engineering has revealed itself in a series of elaborate painting machines. Jackson’s newest installation is a fully automatic car wash, modified and designed to transform brand new cars into works of art. Soft cloth brushes on the top and sides have been replaced by a 1 ton spiked metal drum and solid metal rotating balls. 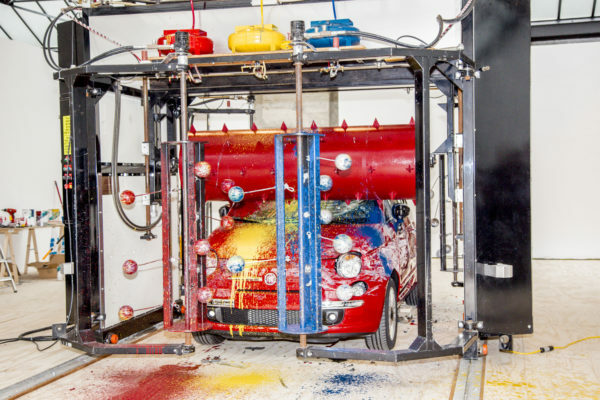 The cars that come out of this machine are smashed, destroyed, and then applied with a clean coat of paint to finish it off. With its clean wide-open space, the CAB offers opportunities for experimentation and is an ideal location for this project. 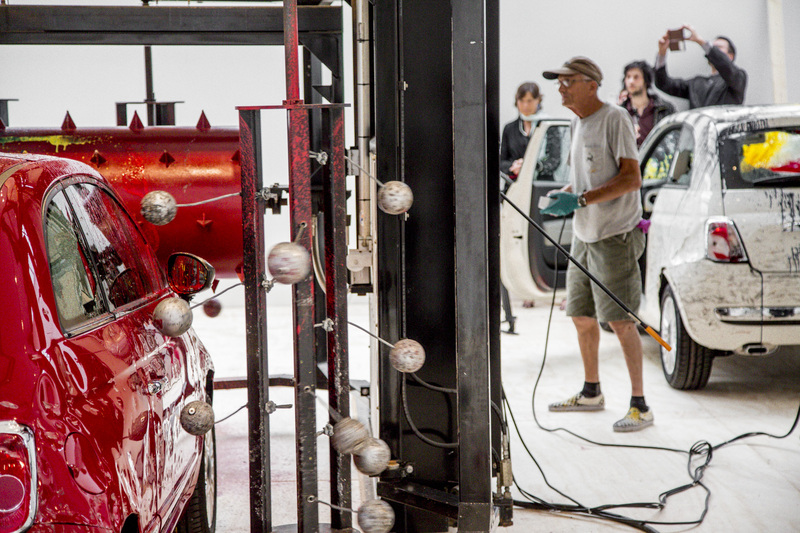 On this occasion, an independent art venue is transformed into a production site and place of action where the artist creates through the act of destruction. Recent solo exhibitions include ‘New Paintings’ at Hauser & Wirth in London, the touring retrospective ‘Richard Jackson. 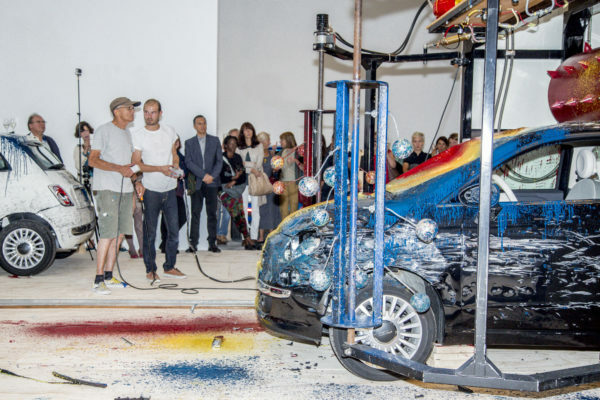 Ain’t Painting a Pain’ which was presented at S.M.A.K., Ghent, Belgium, Museum Villa Stuck, Munich, Germany and Orange County Museum of Art, Newport Beach, CA in 2013; ‘Richard Jackson. 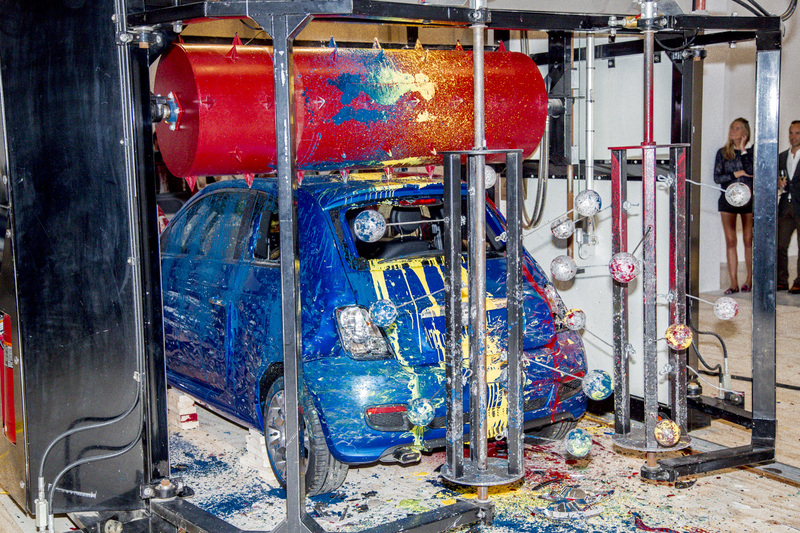 Accidents in Abstract Painting’, at the Armory Center for the Arts, Pasadena, CA (2012), and ‘Richard Jackson. Collected Works’, Rennie Collection, Vancouver, Canada (2010). Richard Jackson is one of the most innovative and radical artists of the past 40 years. A contemporary of Bruce Nauman and Paul McCarthy, his work continues to explore the themes that abstract expressionism started, questioning classic painting principles and evolving towards new, performative as well as spatial dimensions. 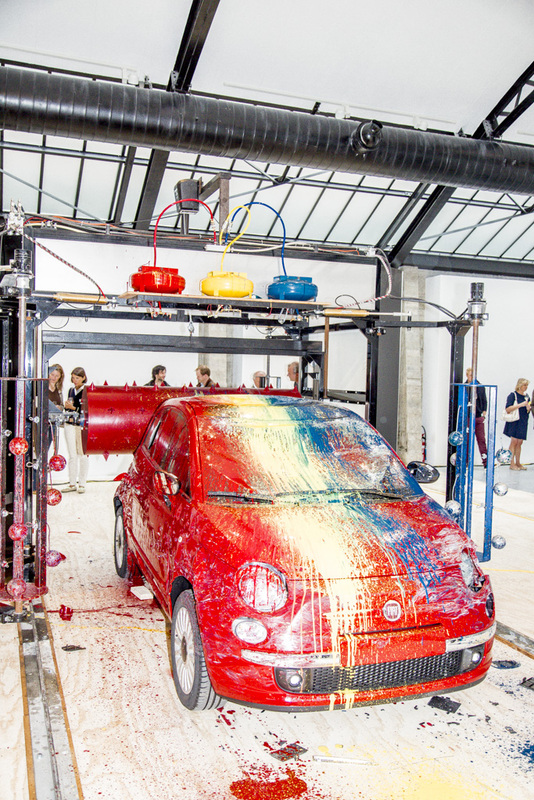 In Jackson’s work, the « Action Painting » and « Dripping » techniques which characterized Jackson Pollock’s and Robert Motherwell’s work are pushed to their limit and become entwined with sculpture and architectural space.During the 1990s, Richard Jackson began creating all sorts of elaborate « Painting Machines ». 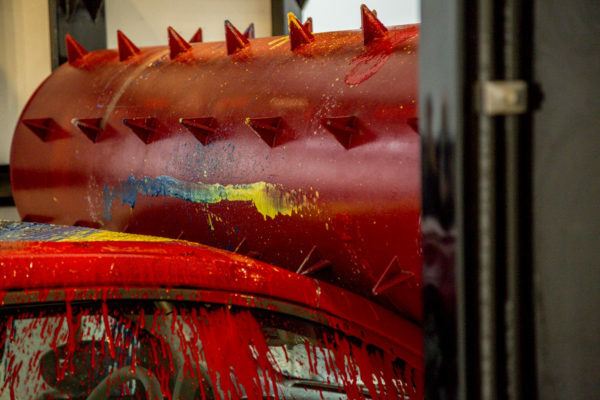 These contraptions present art as an ongoing experimental and creation process, instead of as a finished object.Typically the painting machines are activated before the opening of an exhibition, allowing the viewer to see the traces of a performative painting identity.